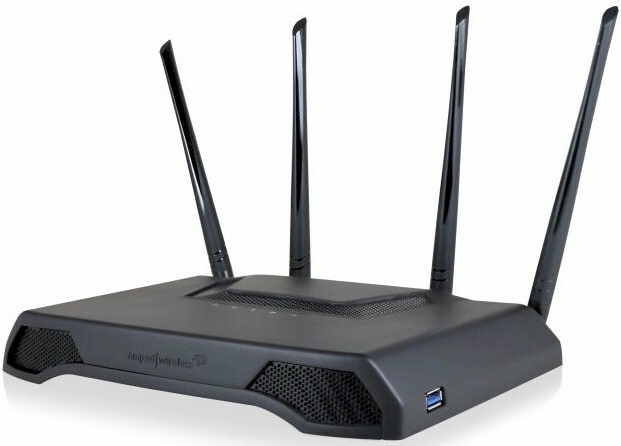 Amped Wireless is the second company to get a QCA-based MU-MIMO enabled AC2600 class router to market. Nicknamed "Athena", the RTA2600 High Power AC2600 Wi-Fi Router with MU-MIMO is now the new top of Amped's router lineup. To recap, AC2600 class routers are the latest generation of 4x4 routers, with AC2350 / AC2400 being the first. Both old and new 4x4 routers support a 1733 Mbps maximum 5 GHz link rate. But the new generation gets a bump from 600 to 800 Mbps maximum link rate on the 2.4 GHz side due to QAM-256 support, a by-product of using the same radio chip as the 5 GHz side. 1733 + 800 = 2533, which all wireless router makers have decided to generously round up to justify the AC2600 classification. The more significant feature of the AC2600 class, however, is that it has MU-MIMO support. MU-MIMO is a technology that improves total throughput use, but requires clients that also support it. As of right now, there are only a handful of MU-MIMO enabled clients and manufacturers aren't going out of their way to rush to market with more. So if you buy any MU-MIMO enabled router today, you're unlikely to be able to utilize its key claim to fame. By the way, first generation 4x4 routers all use Quantenna's QSR1000 4x4 radio, which, as of this writing, still does not support MU-MIMO. Getting back to Athena, the rear of the router has four RP-SMA antenna connectors, reset switch, WPS button, power connector, 4 Gigabit LAN ports and Gigabit WAN port. All Ethernet ports have their own embedded link / activity LEDs. There is also a USB 2.0 port for storage sharing and main power and LED on / off switches. The inset shows a USB 3.0 port, situated near the Athena's front right corner (facing front). Note, however, that there is no physical Wi-Fi On / Off switch. The front panel has all blue indicator lights as shown in the callout graphic below. Like Amped's other routers, the panel markings are tiny and a light grey color that makes them hard to make out. LAN port indicators show link and activity, but don't change color to indicate link rate. The bottom of the router has plenty of vent slots, but the top has vent slots concealed under the perforated U surrounding the raised bump at the center rear. The front corners of the Athena also have the vent-slots-behind-perforated-grille design repeated. The router is designed to sit flat on a desk, but can be wall mounted either horizontally or vertically with centrally positioned four-way screw slots. Amped didn't put a short-term hold on its FCC ID docs, so I didn't have to open the router for component identification. The first picture shows the main board out of its shell, but with RF cans intact. There are no heatsinks removed for this picture. Here's a closer picture with the cans removed. It's still not clear enough for component ID. But the FCC internal pictures file had close-ups of all key parts. Here's the Linksys EA8500 board—the first AC2600 router released—for comparison. Key components for both products are summarized in Table 1. There is only one subtle difference in key components. Amped opted to use the QCA9990 radio vs. Linksys' choice of the QCA9980. QCA describes the 9980 as aimed at router and gateway designs while the 9990 is for enterprise access points, but doesn't detail the differences.